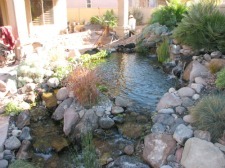 Adding a koi-pond to your landscape plans will add much pleasure to your outdoor experience. 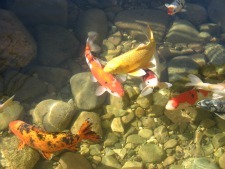 Watching the Koi swimming is always relaxing and enjoyable. 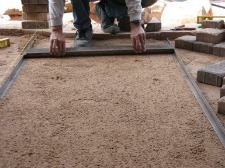 You may provide a bush that will shade the water for the fish to hide under. All the plant life within the water helps keep the water clean and healthy for the fish. The correct plants will keep algae growth under control too. Lilly pads add shade for the koi and they add nice pleasing appearance to your ecosystem. In addition, the lily pads will contribute to the health of the water.